I started out dodging floating docks and lumber of all kinds. Slow and easy is the only way to operate a boat at this time in the back bay waters. If your boat does not have a steel hull, expect it to be damaged if you run in the Ocean or the Delaware bay at this time. I found that most of the back bay waters are completely void of fish. The water temperature was between 45-54 degrees. I was lucky and found clean water, that was holding a few speckled sea trout. I had a few small stripers in the same spot yesterday. The upcoming North East storm could pretty much end the fishing season here. Time will tell. 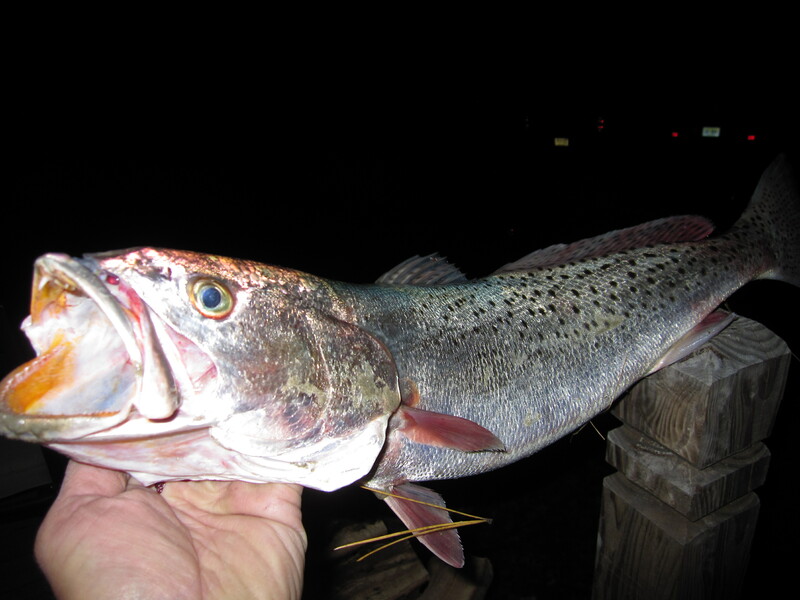 Specks don’t migrate the way weakfish do. I would bet they are year around residents. In the South they move into creeks during winter. Brian, good to hear from you. I am not sure about NJ specs not migrating?Very few NJ specs are caught in the spring and summer, 95% are caught in the fall. They could by here year round, I sure as heck can not find them in the spring or summer. I know many have been tagged here in the fall, but none of the tags have been returned. Maybe we can get someone from Rutgers U. to track a couple with the new gps tags?